Warning: There are also scenes of graphic violence, off-page abuse/torture of minors, off-page reference to sexual abuse of a minor. Twelve dead children. An ex-priest with the faith to move mountains. A hunter out of the depths of legend. Together, they must find a way to overcome their pasts and become something entirely new if they are to defeat an ancient evil. David Shaughnessy was content in his life as a police detective in Armata, California. It lacked the visceral, sick thrill that came with exorcising demons, but it was better for him, saner. Until the night he got called out to a vicious murder in the woods, and met Dallan Jaeger. The older man and Interpol agent is much more than he seems to be, and their connection is immediate, powerful. Trust blooms quickly as they learn to work together to pursue the evil fae responsible for the murders. They must learn to do more than trust each other if David is to fulfill his birthright and claim what was so long denied him. Only then do they have a hope of catching the killer…in the Twist. L.A. is a professional writer finally crossing over into fiction. She has a background in the Classics and Religious Studies, and those themes will come up again and again in her work. L.A. lives in Texas, has two incredible kids, and a varying number of rescue mutts. Reach out to her on Twitter; she’d love to hear from you! In The Twist opens with a shocking scene. Did you intend this book for horror readers or paranormal readers, or both? Most definitely both. I wanted to set the stakes high at the very beginning of the book, establishing the level of evil our protagonists are up against, and imbuing it all with that ‘it’s 4:30 in the morning, in the woods, in the misting rain, and there is something here so unspeakable as to seem unreal’ feeling. Disconnecting readers from what they expect and throwing them headfirst into the world, in other words. I think readers of both genres can appreciate that. There’s a creature called a Sluagh: is this your invention, or is there lore about it? How does one say this properly? There is long-established lore about fairies called Sluagh in Celtic mythology, so I borrowed them for my villains. The modern Irish pronunciation of the word is “SLEW-a,” and they were said to be perhaps the souls of the restless dead. Their name means “horde” so I played pretty fast and loose with the lore in making them notoriously solitary. I see them as creepy-crawlies of the lowest order, skulking around and typically feeding on humanity’s negative emotions and actions. One of the characters has an Irish name: Saoirse. What’s the right way to say this? What made you decide to use this name? You say her name “SERSH-a.” I’ve always loved the name, and I wanted to telegraph in a subtle way that David and his sister are from Ireland without having to come out and say it right up front. Show, don’t tell, right? What do you find the biggest challenge about writing fiction as opposed to non-fiction? I would say that plotting is by far the biggest challenge. I love characters—I love tearing them open and getting at all the good stuff inside. I love to have them interact, I love to create them. When you’re writing about something like enterprise-grade servers, you don’t exactly have plot to contend with. And I can’t exactly have them talk for the whole novel! I can see David and Dallan having more adventures: what are your plans for them? Oh, they most definitely will have more adventures! I’m working on the sequel to In the Twist, called Titan’s Reach, which should be out next year. I can safely say without spoiling that David doesn’t stay an Armata PD detective for long after the end of the novel. In the teaser included with the book, we already meet one of Dallan’s strange and wondrous co-workers at the Bureau for Preternatural Affairs. David and Dallan have a lot of chemistry: did you enjoy writing this part of the story? Is this the first M/M romance you’ve written? I love my boys. I love a love that is undeniable and inevitable and yet at the same time not guaranteed. It’s a dance between David’s legions of issues and Dallan’s incredible patience. Love at first sight doesn’t always equal a happy ending or an easy road. I very much enjoyed writing them, figuring out what David would do with these feelings that he most assuredly did not authorize. I’ve been writing M/M romance, if I’m honest, since I first started writing fiction, which was as a teenager (I am mumbledy-fortyish now). I also have a lesbian novel in my queue set in Bronze Age Greece, so it’s queer lit that moves me, not just M/M. Is there a particular M/M romance that inspired you to write in the genre? Every M/M romance inspires me, because every drop of representation counts, doesn’t it? There’s something about deconstructing toxic masculinity and building something deeper and truer that really appeals to me, and hopefully to my readers! Hanging in the tree, the boy’s body looked unreal. A forgotten Halloween decoration, the gore so over-the-top there was something almost cartoonish about it. Yes, David Shaughnessy thought, except for the smell. He wrapped his inadequate suit coat more tightly around his tall, lanky frame and stood in what he was already thinking of as “the viewing circle”—a ring of seemingly random detritus that formed a perfect vantage point from which to view the dead child. His long-fingered, elegant hands were jammed unceremoniously into his pockets, twitching to make the gestures of faith that he was not entitled to perform. Dear God, if You have any love for the lost, take this child in Your arms. Forgive his petty, childish infractions and grant him Your most blessed peace. That the boy was a runaway was obvious to him: David could see past the fetid, swollen ropes of intestines arranged in elaborate patterns in the branches, the odd way the tree itself seemed to have taken hold of slender arms in a wrap of branch and twist of vine that was not natural, but couldn’t really be man-made. There were needle tracks on those delicate arms, clothing that was tattered and torn, and a sweet, thin face just barely introduced to shaving beneath the rictus of pain and fear. “Right,” Ellen said, tossing him a glare as she picked through the clearing with her sensibly attired team armed with flashlights until they found places to set up the harsh spotlights. David stepped out of the ring and blinked. The scene became palpably less clear to him as the light of his pocket flashlight was swallowed by the rain and predawn darkness. The light didn’t quite reach to the boy in the tree, and all the details that were so distinct became dim in the distance. A shiver raced down his spine, and he knew it had little to do with the cold and damp. His hand went to the small intricate silver crucifix beneath what had once been a nicely pressed and starched dress shirt. In the absence of that clarity, he was forced to move closer to the powerful stench, but he willed himself to put it away, to bear witness without blanching. It was the least he could do for this lost boy. The very, very least. An absent request brought a ladder over, and he leaned it somewhat haphazardly against the tree before clambering up it to look more closely. The boy was no more than thirteen, perhaps fourteen and excruciatingly small for his age. David shined his light to the boy’s face and almost fell off the ladder. Amidst the filth and rain, the small features were composed: eyes carefully closed; face washed clean; wet, dirty hair raked back and some attempt made to untangle it, probably with fingers. There were flowers woven into his hair, flowers that smelled sweet this close, pure and white in the middle of this late-winter muck of rain. Someone had tried to help. “Um, thank you for that…astute…” There was no point in being rude, especially since the unidentified man was correct. “Yes, thank you.” David peered down at the man but couldn’t make out much thanks to the damnable mist and the man’s very weather-appropriate hat. He summoned his few shreds of dignity and climbed down the ladder to face the newcomer. The stranger was older, perhaps in his late forties, with the sort of face that was kind and predisposed to smiling. David found himself staring into warm, gray-green eyes, rapt, and the cold seemed to seep out of his bones. 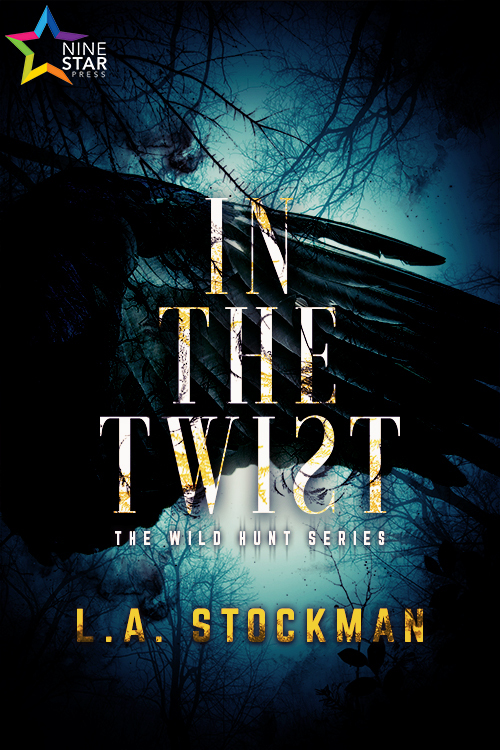 Check out Ninestar's events calendar for information on additional blog stops for In the Twist and other upcoming releases! That was all just brilliant! I am sure the book will be a great success.